The Chairman of Nissan Motor Company was arrested in Japan early Monday, accused of financial misconduct, according to reports from the Associated Press. 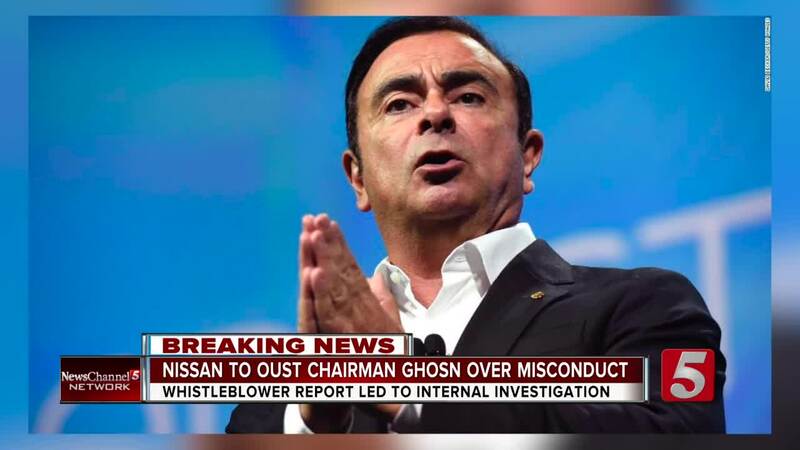 Carlos Ghosn was also dismissed from his position, the company said. Ghosn was questioned by prosecutors in Tokyo in connection with an investigation into whether he and another board member under-reported his salary. According to a statement from Nissan Motor Corporation, "the investigation showed that over many years both Ghosn and [Greg] Kelly have been reporting compensation amounts in the Tokyo Stock Exchange securities report that were less than the actual amount, in order to reduce the disclosed amount of Carlos Ghosn's compensation." "Nissan has been providing information to the Japanese Public Prosecutors Office and has been fully cooperating with their investigation. We will continue to do so," the statement said. Smyrna is home to a Nissan plant that employed 8,400 people as of 2016. Nissan said it invested $6 billion dollars into the plant. The Titans stadium is also named after the automaker.